Activate the Resonator of Judgment. Speak with Sheogorath and Haskill. Travel to Xedilian and locate the three Focus Crystals. Tune and activate the Resonator of Judgment. 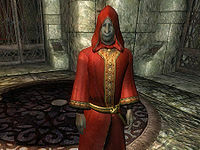 Sheogorath explains that he has chosen you to stop Jyggalag, the Daedric Prince of Order, from executing the Greymarch: an event that befalls the Shivering Isles at the end of every Era. To this end, he tasks you with reactivating Xedilian, a method used to deal with unwanted adventurers prior to the creation of the Gatekeeper. He gives you a Manual of Xedilian and the Attenuator of Judgment in order to tune the Resonator. You can either read the manual or speak to Haskill to learn how to activate it and advance the quest. Travel to Xedilian, which is located along Pinnacle Road, next to Rotten Den. Upon entering, you will receive a quest update concerning the activation of the "Resonator of Judgment". You must retrieve the three Focus Crystals and place them into their appropriate Judgment Nexuses. The quest marker will lead you to a room occupied by Grummites. Kill them and retrieve the Focus Crystal from the Grummite Shaman's staff. Open the nearby doors and place the Crystal in its respective Nexus. Repeat this procedure for the second and third Focus Crystals. When all 3 Focus Crystals are in place, make your way to the Resonator of Judgment. 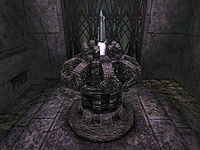 It is found in the final room of the second zone and is guarded by a final Grummite Shaman and several other Grummites. Kill them and activate the Resonator using the Attenuator of Judgment. Following this, the adjacent gates will open, revealing a now active teleportation pad. Activate the pad and you will be transported to another section of Xedilian, where you will be greeted by the Dunmer Kiliban Nyrandil, which will initiate the next quest. Sometimes the Grummite Shaman will not spawn. If this happens, wait for the area to respawn and try again. 5 I should speak to Sheogorath and see if he has any further need of me. 8 I've been given the Manual of Xedilian and a strange device called an Attenuator of Judgment by Sheogorath. I've been directed to proceed to Xedilian, and to return the place to working order. I should either read the Manual or speak to Sheogorath's Chamberlain, Haskill, to familiarize myself with the strange dungeon. 10 I've learned that in order to restore Xedilian, I must activate the Resonator of Judgment. To do so, I will need to find three Focus Crystals and place them each in a Judgment Nexus, which will prepare the Resonator for attunement. I should proceed to Xedilian now and begin my search. 15 I've entered Xedilian. I should now begin locating the Focus Crystals that link the Resonator of Judgment with the rest of the dungeon. 20 I've discovered the first of the three Focus Crystals. It was affixed to the top of a Grummite Shaman's Crystal Staff. I think they are using the crystals as a power source for their weapons. Now that I've removed it from the staff, I should place the Focus Crystal in its Judgment Nexus to continue. 25 I've placed the first Focus Crystal into its Nexus. I can now continue searching for Focus Crystals. 30 I've discovered the second Focus Crystal. I should place it in its Judgment Nexus to continue. 35 I've placed the second Focus Crystal into its Nexus. I can now continue searching for the final Focus Crystal. 40 I've discovered the third and final Focus Crystal. I should place it in its Judgment Nexus to continue. 45 I've placed the third and final Focus Crystal into its Judgment Nexus. The path to the Resonator of Judgment itself is now clear. My next task should be to attune the Resonator by using the Attenuator of Judgment that Sheogorath provided me. 200 Finishes quest The Resonator of Judgment has been attuned. It is possible to use the console to advance through the quest by entering setstage SE03 stage, where stage is the number of the stage you wish to complete. It is not possible to un-complete (i.e. go back) quest stages. See SetStage for more information. This page was last modified on 4 February 2019, at 10:10.